This easy recipe for homemade chicken noodle soup can easily be prepared almost as quickly as the packaged stuff, and is actually made with real chicken. Before you do anything, you need to fry up roughly half a pound of chicken breast. 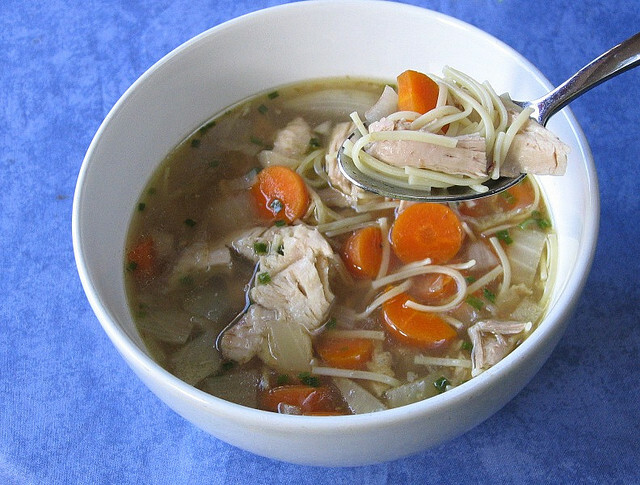 Your chicken should be thoroughly cooked before using it for this soup recipe. Chop up your celery and onion. You will need about a half cup of each. Add more or use less depending on your opinion of sort-of-crunchy things. Bring a large pot to medium heat and add a tablespoon or two of butter. Cook your celery and onion in the butter for between 5 and 10 minutes, or until they begin to soften. Once the celery and onion begin to soften you can pour in your chicken broth. You should add about six to eight cups of broth. More broth would just give you more soup but unless you balance out the broth with more soup-stuff then it probably isn’t worth it. Now you can add your (already cooked and cut) chicken, about a cup and a half of egg noodles, some chopped carrots, and your spices. You should use a teaspoon or less of both oregano and basil, and as with anything else, you can add salt and pepper to taste. Once you have everything combined in the pot, bring the soup to a boil. Once it reaches a boil, reduce the heat and let your chicken noodle soup simmer for about twenty minutes. Basil, oregano, salt and pepper are just recommendations. This is an area where you can easily experiment or just use something you like better. Homemade chicken broth is an obviously better choice than the canned stuff but for the purposes of this simple recipe, the canned stuff is probably more reasonable. As with most soups and stews, letting this chicken noodle soup simmer longer will result in an overall better soup. Beyond twenty minutes you will see diminishing returns, though.